As darkness deepens on Monday evening (June 25), look about one-third of the sky up from the southwest horizon. There you'll see a fat crescent moon, and a moderately bright yellow-orange "star" hovering well above and to its left. But that's no star — it's a planet. It might be difficult to believe that it's the same object that less than four months ago shone some seven times brighter. It's Mars, which continues to recede from Earth and consequently continues to fade. Currently the Red Planet is 129 million miles (208 million kilometers) away from Earth and shines at magnitude +0.8. That's still a fairly respectable brightness; on the list of the 21 brightest stars, Mars would currently rank 13th. Still, that's quite a comedown from early March, when Mars shone with a brilliance just a trifle less than that of Sirius, the brightest star in the sky. In terms of apparent size, the disk of Mars is now downright tiny; only a large amateur telescope is likely to show any dusky markings on it. The gap separating the moon from Mars tonight will be roughly equivalent to the width of your clenched fist held at arm's length, which measures about 10 degrees. By Tuesday evening (June 26), the moon will have arrived at first quarter phase and will have shifted its position relative to Mars, hanging off to its lower left and at a similar distance compared to the previous night. Mars is currently positioned against the dim stars of western Virgo and it's on its way toward a mid-August night sky rendezvous with the planet Saturn and the bluish star Spica. 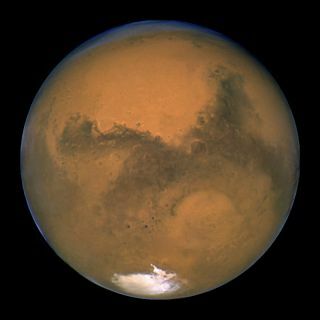 Take a good look at where Mars is right now. About 25 degrees — two and a half fists — to its lower right is the bluish first magnitude star Regulus in Leo. At a similar distance to Mars's upper left are Saturn and Spica. If you're a beginner in astronomy, consider the moon as a convenient benchmark to help you identify Mars early this week. On Wednesday evening, the moon will be within striking distance of Spica and Saturn. Yellow-white Saturn will be above bluish Spica and will appear somewhat brighter. While Mars is a disappointment in a telescope, ringed Saturn now appears nearly three times bigger than Mars, offering a spectacular sight.